Two weeks before our departure from the mainland my knee decided to fail me. I had been training again trying to get in shape from my foot being broken nearly all Summer. Miserable as that was, I was excited to be out again and getting in shape in time for some Winter fun and our anniversary trip. My knee thought otherwise and I was reduced (once again) to painfully hobbling around the house with limited mobility. Awesome…Hawaii here we come! We arrived in Honolulu for the first leg of our trip. We would be staying one evening here before moving on to the Big Island so that I would get to see the USS Arizona Memorial at Pearl Harbor. My wife has been, but since this was my first trip to the islands we made time to make sure I would be able to see the Memorial. The long flight had been hard on my miserable knee so we reluctantly chose to push Pearl Harbor off to the next morning and explore the North Shore a little bit and maybe catch the sunset. We fought our way through afternoon traffic to get outside Honolulu and head toward the beaches. Still pretty sore and stiff from the long flight, I had a hard time getting around but luckily the road pretty much follows the shoreline and there wasn’t much hiking to get to the beaches along the North Shore. We stopped at a few places, got to see some turtles, had a little snack and waited out the sun as it slowly settled to the horizon. We stopped at Sunset Beach and while my wife got out the beach towel to lay in the sand and soak up the last hour or so of sunlight, I hauled out the camera gear and set up to catch the fading light. The weather was nice, there was a slight breeze and a nice set of clouds in the west for the sun to play with as it set. The sunset wasn’t spectacular but it was pretty nice and it allowed me to get the equipment dialed in. After sunset we headed back to Honolulu for a nice sushi dinner and some much needed rest. My knee kept me from getting much rest, but we were excited to get out to the National Memorial before our flight to Hawaii. My wife turned on the news as we were getting ready and that’s when we found out about the closure of the National Parks. Blindsided and somewhat devastated that we were going to be denied access to the only reason we stayed in Honolulu AND potentially miss out on the main reason we were visiting Hawaii we scrambled for some answers. I called the number listed for the Pearl Harbor Visitor’s Center and spoke with a woman who assured me that the memorial, or at least most of it, was still open. She was partially right, the collection of memorials and monuments at Pearl Harbor are managed by the NPS but some of them, like the Pacific Aviation Museum are actually on the military base property and were therefore still open. DOD funding was intact, so the USS Missouri and the museum were still open but access was now cut off so they were shuttling visitors onto the military base to access these memorials. It was a mess and no one really knew what was going on. We spoke with some very helpful NPS Rangers stationed in front of the visitor’s center, but their news was grim. This would not be a quick resolution, the parks would likely be closed for a while. We reluctantly gave in and headed to the airport. After a pretty rough flight (my knee was really having a fit with all this travel) we landed in Hilo, grabbed our car and headed to Volcano to check in to our cottage. We rented a private cottage from Hale Ohai cottages in Volcano. Our place was awesome and set back in the thick jungle vegetation making for a beautiful setting. Unfortunately, we wouldn’t get a chance to spend much time there. As most everyone knows now, the National Parks stayed closed for over two weeks which meant that our 5 day adventure in Volcanoes NP was spent outside of Volcanoes NP. Every morning we woke up hoping that the shutdown was over the park would be reopened. It was sort of our obsession throughout the trip. The upside of being locked out of the National Park was that we got to see much more of the rest of the island than we had originally planned. 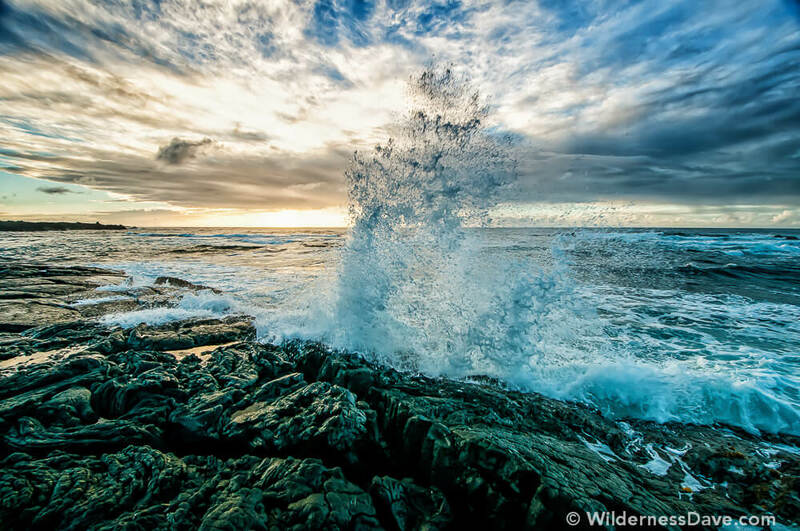 There is so much to see on the Big Island. Even being limited by my meager mobility we still got to see a ton of diversity in Hawaii as we ventured out from our home base in Volcano. 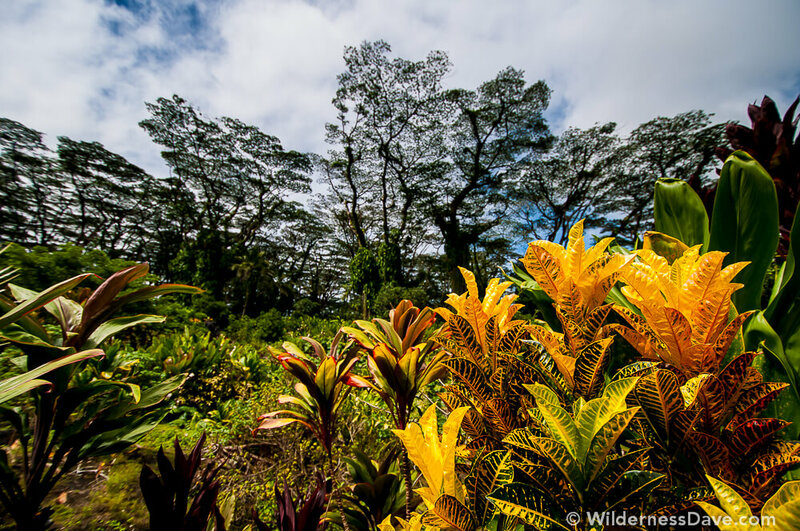 Exploring the gardens and waterfalls around Hilo, the rough and rugged coastlines around the southern tip of the island, the high grasslands between Mauna Loa and Mauna Kea and various beaches. Ultimately we had a great time driving around the island exploring State Parks, beaches and old lava flows. We had some great meals in Kona and Waimea and found some amazing little roadside mom-and-pop restaurants. Parks closed or not, we still had a great time exploring the diversity in Hawaii and spending time with each other on our anniversary. 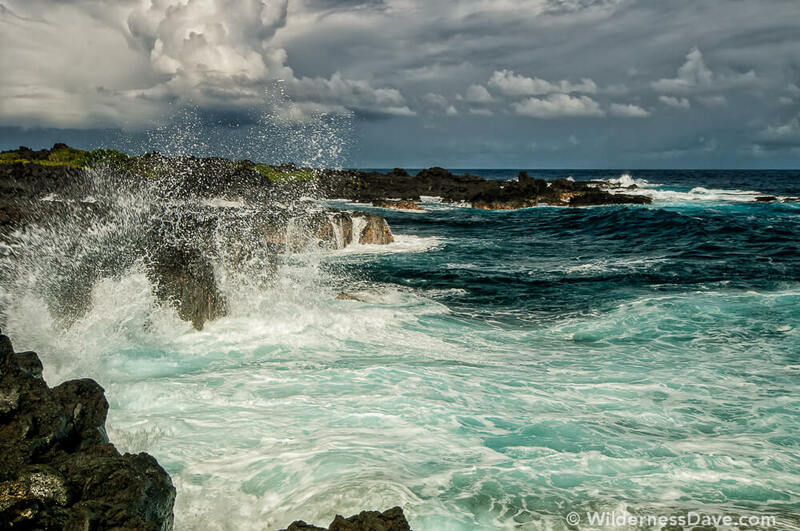 Cape Kumukahi is just outside Hilo near Puna and was a rough and tortured coastline of old lava flows broken and twisted by the relentless action of the waves. Throughout our trip, this area was usually cloudy and raining but we happened to catch it one morning when the sun was out and the clouds were still gathering in the distance. It’s beauty is in it’s hostility, the sharp black lava rock with very little vegetation and the hard crash of the waves on this side of the island. 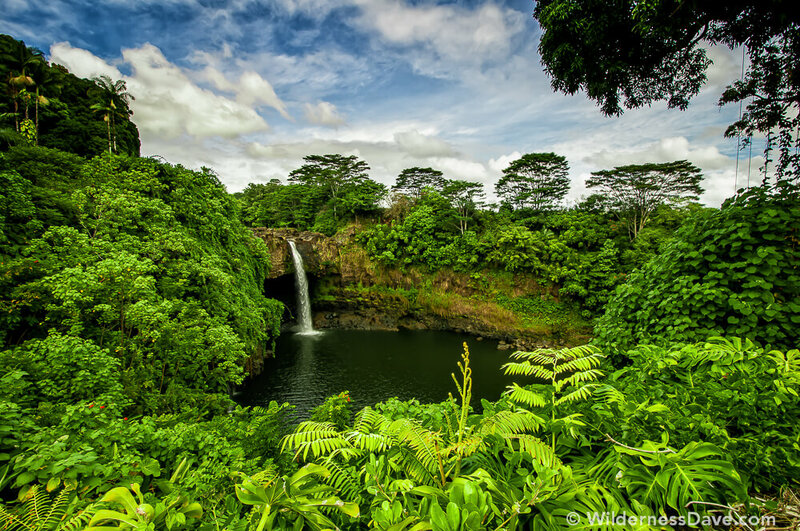 Just minutes outside of Hilo is Ranbow Falls, one of the most visited falls on the island from what I’ve read. It’s really easy to access and there are paved walks to view points to see the falls. Many tour buses drop off loads of cruise ship tourists to come in and snap some pictures and gawk at the dramatic falls and lush vegetation. It is no doubt a beautiful spot, and the falls is much larger and more dramatic during other seasons but I would have liked to visit more remote falls had I been more ambulatory. Lava Tree State Park is also near Puna and hosts a unique feature on the island. Vertical lava tubes dot the park. These unique features were created when molten lava washed through the area in the 1790s and cooled faster around the large trees as it washed over the land. The trees burnt out leaving hollow vertical tubes that still stand today. Past the south end of the National Park is Punalu’u Black Sand Beach County Park. 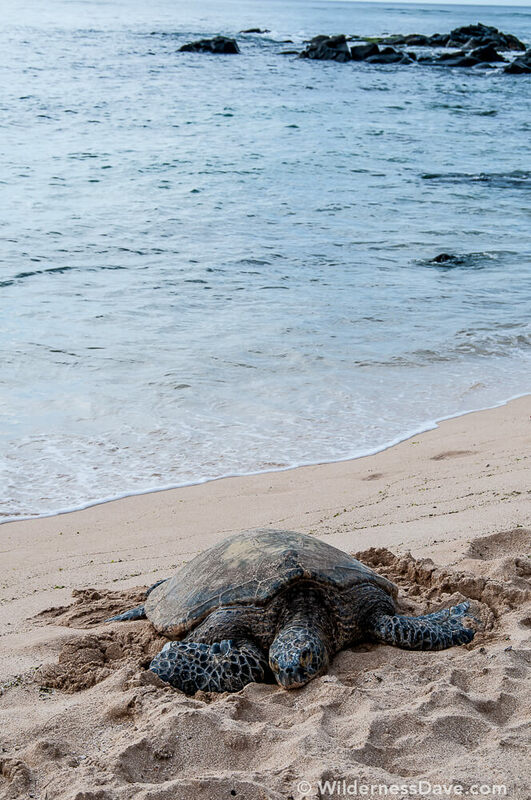 It’s a small protected black sand beach area with some cool lava formations and a small section of black sand beach where we saw another turtle on the shoreline. We actually visited this spot a couple of times during our trip because it was close enough to Volcano to be an easy drive. 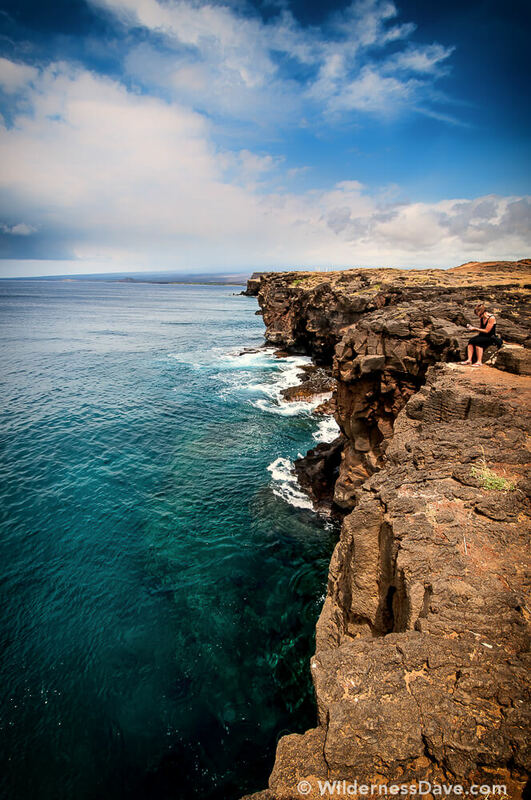 The southernmost tip of the Big Island is also the southernmost tip of the United States and is a pretty harsh area. The seas are calmer here but the currents are still strong. If you can brave the undertow, there is supposed to be some excellent snorkeling at the base of the shear cliffs. There was a lot of long-line fishing going on here when we stopped by. The rugged, windswept cliffs and the expanse of endless ocean beyond really do make this spot feel like the “edge of the world”. Totally unexpected to me were the rolling hills and open grasslands dotted with cattle. 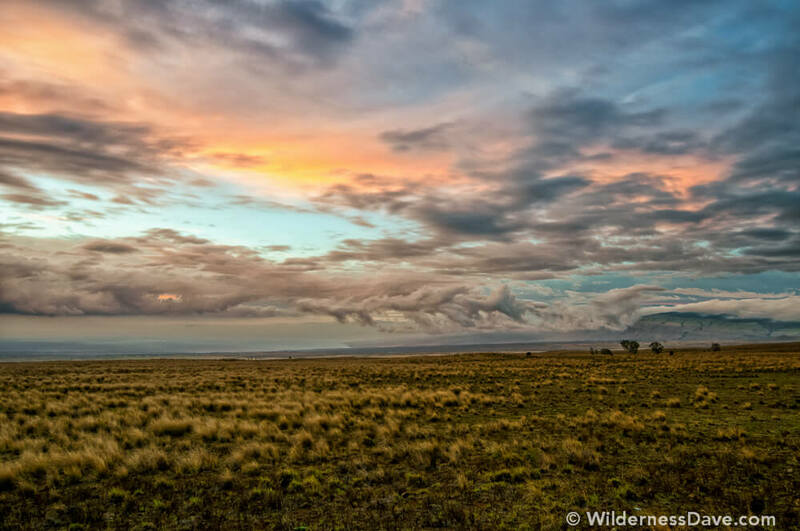 I never expected to see expansive wild grasslands in Hawaii and I found myself staring out at it every time we drove through these areas. It was different than anything I expected to find on a Pacific Island I was slightly in awe of it. We stopped one evening on our way from Kona to Waimea as the sun was setting to grab some pictures at the edge of the highway and these ended up being some of my favorite pictures from the trip. As disappointed as we were to NOT make our trip about the National Park in Hawaii, we still made the best of it and had a great time checking out all that Hawaii had to offer. As I said to my wife several times throughout the trip, there’s no way to see it all in a week. We could spend years out here and never get to see it all. We are already talking about getting back to Hawaii soon to handle some unfinished business. 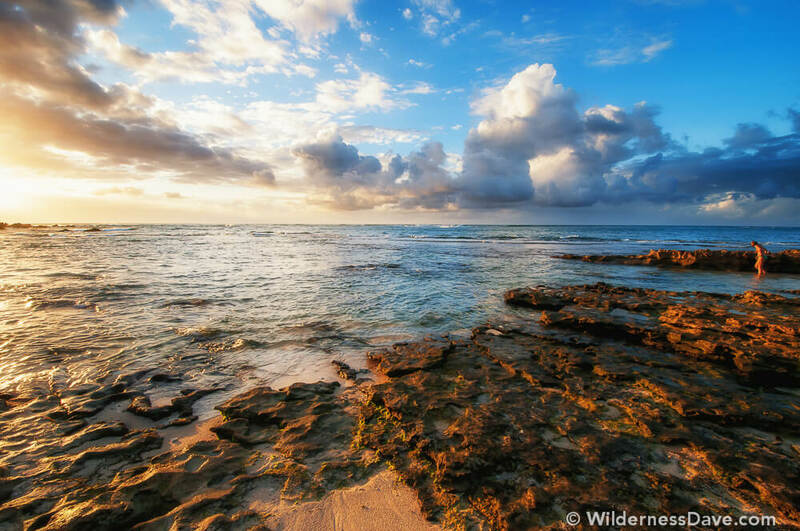 Keep those parks open, Hawaii, and we’ll be back soon!